- ออกอากาศทาง สถานีวิทยุกระจายเสียงแห่งประเทศไทย จ.ตาก (FM 102.0 MHz) ทุกวันเสาร์ เวลา 13.00 - 13.30 น. - ออกอากาศทาง สถานีวิทยุเสียงสื่อสารมวลชน (FM 100 MHz) ทุกวันอังคาร เวลา 20.15 -20.30 น. Faculty of Agriculture, Chiang Mai University aims to provide the academic services and disseminate knowledge to the society. To that end, the �Agricultural Technology Service Centre" has been established in order to be a source of internships and cooperative education student, and providing the laboratory services of agricultural products. The centre also reinforces the university�s role of serving society by supporting academic staffs and students to work with local communities, promoting continuing education, and transferring the agricultural technology and knowledge through public media. 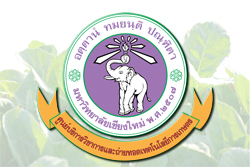 The Agricultural Technology Service Centre, Faculty of Agriculture, Chiang Mai University is the training center for students and provides academic services and agricultural technology to communities, farmers and private sectors. This Excellent Centre delivers full range of agricultural activities. The center is the students training place and the coordination of government agencies, private sectors and farmers in agricultural knowledge and experience exchange. It is also the coordination and supply of internship for students. The center coordinates with public and private agencies in farming knowledge transfer to community through trainings, seminars, exhibitions, conferences. It provides the agricultural knowledge and information through various media and consulting about business management for private sectors, farmers, SMEs. This includes laboratory services and analysis of various agricultural products and act as the Agricultural Information Center (E-Centre). 1. To train the students of the Faculty of Agriculture. 2. To provide the academic services and agricultural technology transfer to farmers, entrepreneurs and other interested persons by integrating the knowledge from Faculty of Agriculture and expert agencies. 3. To encourage the academic services in different ways by combination of technical support and services to meet community needs and respond to community problem solving and include the development of academic services to international level. 4. To support staffs and students in the Faculty of Agriculture to provide academic services to community in the direction of strengthen their teaching and research. 5. To be the service center for laboratory services and analysis of various agricultural products. 6. To develop agricultural business to make revenue and lead to self-reliance of the Faculty of Agriculture. 7. To promote the reputation of the Faculty of Agriculture to be more widely known.